India is a vast country. Before independence it consisted of about six hundred semi-independent kingdoms ruled over by Hindu Maharajas & Muslim Nawabs. Now, even though it has merged as a single country-traditions, poetry and culture of each state go back a thousand years. 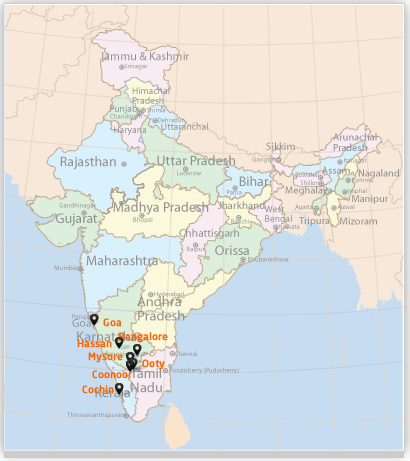 India is that sense is very similar to Europe, with each state, rather like each European nation has not only its own language, culture and foods, but its own history, its own unique geography and its own set of dominant religions. 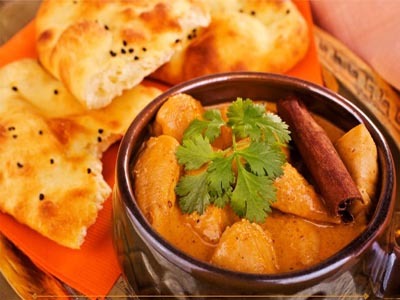 The Indian cuisine is based on this very variety, with a combination of flavours and seasonings. 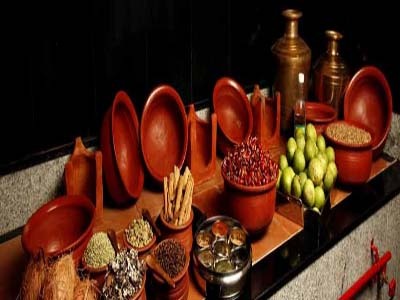 The Indian spice shelf contains more than thirty seasonings - to create a medicine, all spices and herbs have been assigned medical properties. 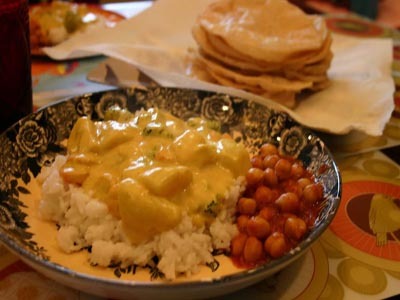 At most Indian meals, aside from meat, vegetables, legumes, rice or bread that are served, there are invariably relishes and yogurt dishes, pickles & chutneys. They round off the full cycle of flavours and textures, adding bite, pungency and often vitamins and minerals. 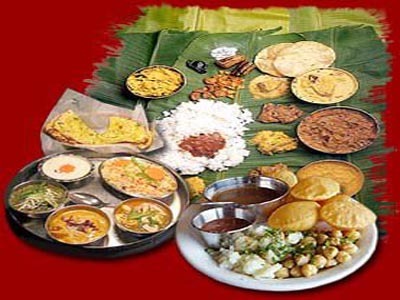 Food in India is eaten not only for survival but also to keep the body finely tuned, physically & spiritually. 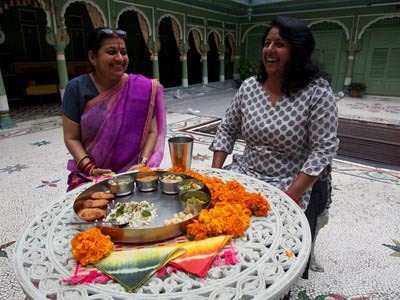 This exclusive Wanderlust Travels "A TASTE OF INDIA" tour for gourmet lovers takes you on a first class culinary journey across this magnificent country, sampling its finest sights and sounds. Guided by culinary experts you will taste foods from different regions that will thrill your palates and may even uplift your souls. Embarkation: Gadkhali Jetty, Sunderbans Upstream : Embarkartion - Kolkata; Disembarkartion - Farakka. Welcome to the capital city of India. A city which depicts the melting pot of all the Indian cultures. 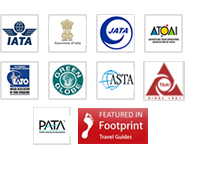 Assistance at the airport & transfer to the hotel. Rest of the day at leisure to recover from your flight. Evening dinner hosted by Wanderlust Travels at the Qutab Farmhouse Complex, set against the magnificently lit Qutab Minar. Familiarize yourself with the warm Indian hospitality of Maj. S. K. Yadav, owner of Wanderlust and their staff. 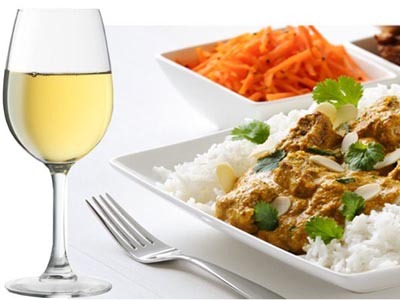 Enjoy drinks and dinner to the accompaniment of modern Indian light music. Overnight Delhi. After a popular Indian breakfast of 'parathas' stuffed baked bread served with yogurt and pickle, we start with a Kashmiri theme incorporated with the sightseeing for the day. Morning tour of New Delhi to include India Gate, Rashtrapati Bhawan (special permission to visit the Mughal Gardens can be taken depending on the month and day of visit), and the Lotus shaped Bahai Temple. 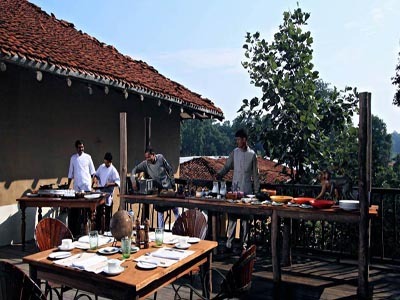 Lunch would be on the Bistro rooftop complex, situated at the Haus Khas village, the original site chosen by Ala-ud-din Khilji in 1303 AD for a 'Madrasa' - a place of learning. Post lunch visit special emporiums for an insight into Kashmiri handicrafts -fabulous hand woven silk and woollen carpets with intricate designs, fine pashmina (cashmere) shawls made from the soft hair of Tibetan goats, woven and embroidered with striking paisley designs. Papier mache objects, woodcarvings on walnut wood, crewel work on fabric and rugs are highly intricate and the finish exquisite. Return to hotel for few hours of relaxation. Evening dinner would be a lavish spread of traditional dishes 'waazwaan' from the state of Kashmir followed by 'Kahva' green tea sprinkled with almonds and cardamom. A Kashmiri food culinary expert will be accompanying you through your meal to tell you all about its preparation and about the lifestyle of the people of Kashmir. Overnight Delhi. 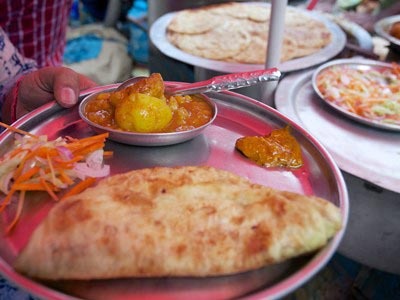 After a traditional north Indian breakfast of 'Poori' deep fried bread served with potatoes, commence on a unique tour of the bazaars of Old Delhi and the Jama Masjid, India's largest mosque. Here you will be taken back to the times when the majority of the trading was carried out from the huddled shops of these lively markets. Take a rickshaw ride to "kinari bazaar" where shops overflow with bright wedding finery, including garlands made of rupee notes, grooms' turbans, rosettes and other glistening tinsel used in marriages. Visit the "naya bazaar", the spice market on Khari Baoli glowing with the aroma of aniseed, turmeric, dried pomogranate, mangoes, apricots and apples, saffron, lotus seed, pickles to edible silver paper used to coat sweets & cakes. The greatest & the most lasting foreign influence on classical Indian cuisine was that of the Mughals, who introduce to Indian food, rich pullaos, biryanis, tandoor cuisine, elaborate baked breads and paans. For lunch experience traditional muslim hospitality in a house that dates back centuries back, built by Mughal nobility. After lunch visit the magnificent Red Fort and witness the Son-et-lumiere. Dinner at Karim's a north-west frontier specialty restaurant. Overnight Delhi. Early morning flight to Lucknow. (IC 435 dep. : 0600 hrs. / arr. : 0655 hrs.). Check into the grand Taj Mahal Hotel. Lucknow, once the capital of the independent Muslim kingdom of Oudh, and the best foods here are rich. Even though the extravagances of the old court have gone, the spirit, civility, graciousness of the flowery language have all remained. Morning at leisure. Lunch is a mango orchard 'kakori' theme. The orchard is the property of the Nawab Kazmi and boasts of producing over sixteen varieties of mangoes in season. The 'kakori' is a cigar shaped Luchnawi speciality kebab grilled on skewers. Witness their preparation, it is quite a feat to make these kebabs but easy to eat them ! In the afternoon visit the Residency, Bara Imambara, Rumi Darwaza, the clock tower and Nakhas in old Lucknow to see the bird sellers. Lucknow is also well known for 'attar' Indian perfumes, chikan work, embroidery, silversmiths, gold zari and sequin work. Later visit 'Tunda', a Lucknow landmark, is the name of a kebab shop in the heart of the city. Witness the preparation of the Tunda kebabs, cooked in enormous cast iron trays, they are shaped like hamburgers and are made of very finely minced meat mixed with dozens of spices, nuts and seeds including nutmeg, mace, cardamom, saffron, coconut fennel seeds and peanuts. 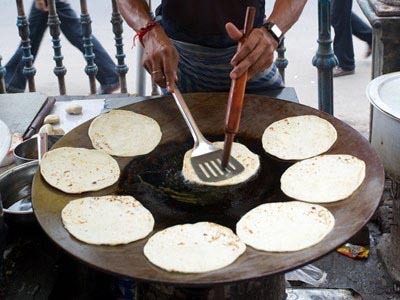 The kebabs, crumbly and soft are browned on both sides and then wrapped in flaky griddle bread. Overnight Lucknow. A days' visit is planned to the outskirts of the city. Take glimpse into the rural life of the simple north Indian farmer. Picnic lunch is organised at the forest Rest House in the Crocodile Sanctuary. A typical Awadh evening and dinner is planned for you this evening, creating the ambiance of the nawabs' court of yesteryear with 'dastakhvan' seating, music and 'kathak' dancers. Overnight Lucknow. Morning drive or fly to Agra by luxury air conditioned coach. Arrive by lunch. Check into Taj View hotel. 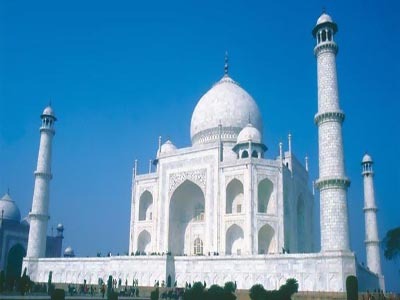 In the afternoon visit the Agra Fort and the fabulous Taj Mahal. The Taj Mahal stands on the Yamuna river, and is a monument that needs to be experienced and observed at different times of the day from far and near to get the feeling to the sheer beauty it evokes. Tonight is a 'khema' theme dinner organised on the roof of a fort overlooking the Yamuna river, with glimpses of the Taj in case of moonlit night. Overnight Agra. Morning optional visit to the Taj Mahal at sunrise. After breakfast drive to Jaipur, enroute stopping at the ghost city of Fatehpur Sikri. Arrive Jaipur by lunch. Check into Jai Mahal Palace Hotel after a grand royal welcome with elephants, camels and horses. Lunch at hotel. Rest of the day at leisure or for shopping. Jaipur is known for its jewellery and gemstones, carpets, colourful tie & dye or block printed fabrics and linen, blue pottery and other handicrafts. If in season witness a polo match in the evening and may be meet the Maharaja of Jaipur. Dinner will be a visit to 'Chowki Dhani' where a complete Rajasthani desert village is created, with village dancers and musicians. 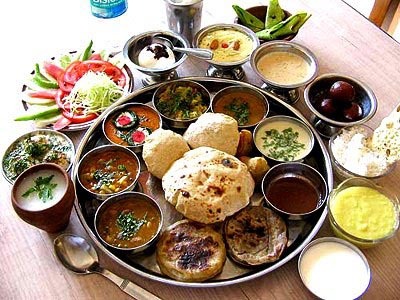 Taste the everyday food of the Rajasthan peasant. Overnight Jaipur. Morning city sightseeing including a visit the City Palace, Palace of the Winds and the Observatory. Later visit the Amer Fort on elephant back. Lunch will be organised in the adjacent Nahargarh Hilltop Fort. Evening drive to Samode Palace. On arrival at the village entrance, transfer on to decorated camel carts, the caravan will be escorted by torch bearers and local musicians through the cobbled streets and village upto the palace gates, where you will be received by the village elders welcoming you with garlands, tikka and showers of rose petals. Check into the Palace hotel. Cocktails will be with the Prince at the Sheesh Mahal (Hall of Mirrors) and then proceed to the Durbar Hall for a banquet befitting a king. The ambiance created goes back six hundred years when the king and his lieutenants would sit on the cushioned floor and the dancers would perform. 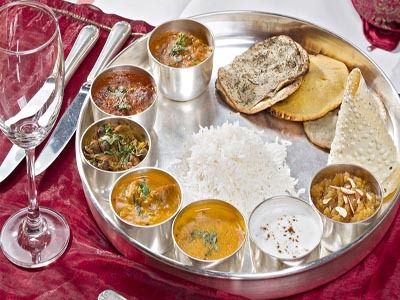 Gentlemen will be provided colourful turbans and ladies, scarves as they feast on a royal Rajasthani fare. Overnight Samode. Morning camel ride to the royal orchards for breakfast. Later drive to Delhi, reaching in time for evening flight departure 1640 hrs. to Hyderabad. Arrive 1840 hrs. Transfer to Hotel Taj Residency or similar. Evening free to relax. Light continental /Chinese dinner at hotel. Overnight Hyderabad. Some cities age with time, some grow to become cultural capitals. The former princely state of Hyderabad is one of the fines examples of the latter, it still retains the flavour of an earlier period. It has long been a center of Muslim learning and culture, the city reflects a fascinating mix of ethnic cultures with architecture of Persian, medieval and colonial flavors. 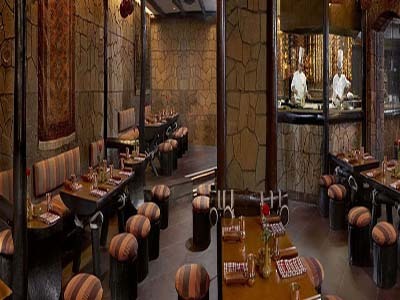 The cuisine of Hyderabad is one of which every Hydrabadi is justifiably proud of. Nurtured by what was once a wealthy Muslim court in the heart of South India, the cuisine combines the very best of Muslim foods-kebabs, pilafs, kormas and yogurt dishes with the hauntingly aromatic, tart, pungent, and creamy flavouring of the South. Begin the day with a visit to the Salar Jung Museum, housing an extraordinary private collection of unique, rare and fine art objects representative of the great wealth of the Nizam, who was once the wealthiest man in the world. Later visit the Char Minar the city's landmark, with it's four minarets. Built in the 16th century, it still stands amid the bazaars of the old city. Lunch is organized at a local Nawab's home to experience the courtesy and hospitality of Hyderabadi hosts. Afternoon explore the colourful market, Hyderabad is known for its pearls, 'bidirware' vases, boxes, jewellery to tiny buttons. 'Pocahampalli' and 'ikat' fabrics, glass bangles inlaid with semi precious stones, lecquer toys, Kalamkari art and antiques. In the evening witness a spectacular son et lumiere at the Golconda Fort. Followed by dinner at the grand Falaknuma Palace, the former residence of the Nizam of Hyderabad. Laid out in traditional 'chowkies' - low tables against a back drop of soulful ghazals, relive the gracious art of fine living perfected by the Nizams of Hyderabad. Overnight Hyderabad. Morning flight to Madras dep. 0845. Arrive 0945 hrs. Transfer to Fisherman's Cove, situated on the Covelong Beach, quiet, tranquil and far away from the city. Built on the ramparts of an old Dutch fort, the Fisherman's Cove is set amidst whispering casuarina and palm trees, on miles and miles of fine sand. Morning at leisure on the beach. Lunch would be freshly caught seafood. After lunch visit Dakshinchitra, it is an art and craft foundation representing the four Southern states in a setting of traditional 19th century architecture. Also visit Mahabalipuram, famous for its unique 7th century Shore Temple, one of the oldest temples in South India. Evening special South Indian Udipi dinner with classical bharatnatyam dancers. Overnight Chennai. Morning at leisure on the beach. After late Iyengar breakfast of coffee, dosai and idlis, eaten with chutneys and dal transfer to airport for flight to Cochin departure 1305 hrs. Arrive Cochin 1510 hrs. Transfer to the Taj Malabar Hotel, which commands a breathtaking view of Cochin's famous natural harbour. Cochin is a city of waterways with a varied history. Notable here is the Jewish population which arrived over 2000 years ago as refugees from Jerusalem and have maintained a strong community ever since. Hungry for spices, the Dutch arrived followed by the Portuguese and finally the British. All left their scenic seaport. Evening visit the spice market and sun set cruise to Bolghatty Palace and Chinese Fishing Nets. Witness a Kathakali dance drama. Dine on traditional Chettinad cuisine which is as distinctive in its form as other features of its cultural life, reflecting both its diverse religious traditions, its seaboard location and the ubiquitous presence of the coconut. 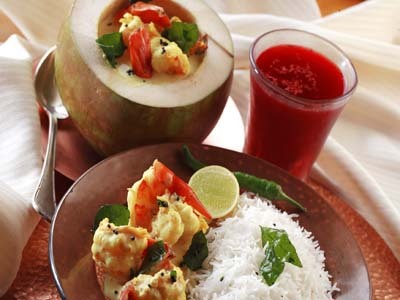 Coconut based sea fish, prawns, shrimps and crustaceans are prepared with vegetables tossed with herbs and a variety of curry leaves. 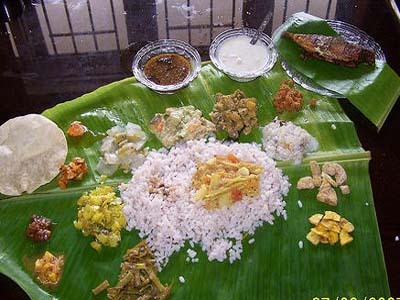 Rice is the staple food, served on banana leaves with 'pappadum' and 'rasam' (clear soup). Overnight Cochin. Morning city sightseeing of Jewish Synagogue and Mattencherry Palace and the church of St. Francis. Transfer to houseboats 'Kettuvallams'. Each houseboat has a capacity to accommodate six people and has modern facilities like bedrooms, toilets and sit outs. Cruise through the enchanting waterways, tall green palms and the sweetly aromatic curry leaf trees against a backdrop of paddy fields. Kerala is spice country, houses are covered with verdant like foliage. Black pepper vines clamber tenaciously up mango trees, the peppercorns huddling together in bright green clusters like bunches of grapes. Nutmeg fruit hang like tennis balls, cinnamon, clove and tamarind trees compete for a view of the sky while cardamom stays close to the ground. There are ginger and turmeric plants as well, sending fingers of their tuberous rhizomes out into the cool dark earth. 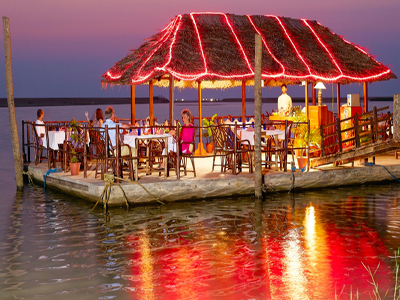 Meals are served on the houseboats. Relish delicacies like 'puttu', 'appam', 'vellayamppam', rice and different types of fish curries and chicken stews served on board in earthenware. Overnight houseboat. Transfer to Taj Garden Retreat. A renovated British planter's bungalow called 'Bakers' Bungalow'. Day at leisure to explore the surroundings or pamper yourself to an Ayurvedic massage. Evening dinner and a traditional martial arts 'kalaripayattu' performance believed to have originated in South India during the 11th century under the Chola rule. Overnight Kumarakom. Morning at leisure and after an early lunch drive to Cochin for flight to Goa departure 1550 hrs. Arrive Goa 1700 hrs. Check into Fort Aguada / Taj Holiday Village. Goa's history stretches back to the Mauryan Empire of 3rd century B.C. followed by a string of hindu and muslim rulers. The flavour today is characteristically Portuguese, who rules for nearly 500 years until 1961. The Fort Aguada Beach Resort, itself is built around a Portuguese fort. Evening at leisure to relax and enjoy one of the most beautiful beaches in the world. Dinner would be on the beach, a seafood bar-be-cue with great Goan wine and a singing guitarist. Overnight Goa. Explore old Goa-Patriarch's Palace, the Se Cathedral, Basilica of Bom Jesus where the body of St. Francis is enshrines, and the Church of St. Francis of Assisi with its beautiful murals and museum. Lunch at hotel, afternoon at leisure. Evening Santa Monica boat cruise with band and singers in attendance on board. Dinner at the famous O'Coqueiro Restaurant, which used to be a favourite haunt of the notorious Charles Shobraj. Overnight Goa. Day at leisure on the beach for a buffet lunch on the lawns of the hotel, relish the "street foods of Mumbai". Enjoy 'bhel puri' - puffed rice, deep fried vermicelli, potatoes, chilli and tamarind paste, chopped onions and coriander. "Pao Bhaji", bread stuffed with vegetables or meat. As a grand finale, on this final evening the theme is that of a Goan fishing village. Artisans display their skills whilst the village dancers whirl to the music to the music of a local band, indulging in song and dance, great food, good wine and happy people. Overnight Goa. Today you transfer to Bombay for your international flight home, taking with you a taste of India, fond wishes from new found friends and vivid memories of the vast cultural legacy that is this heritage of this colourful country.